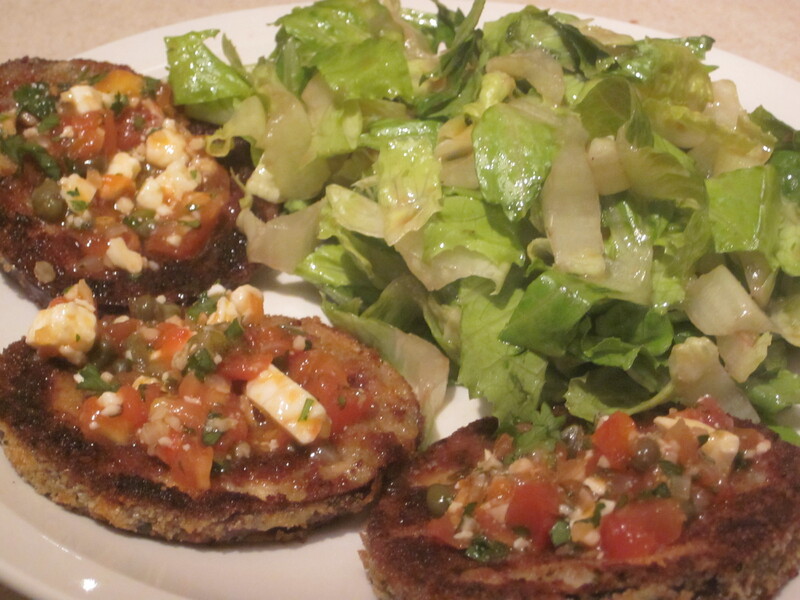 Breaded Eggplant with Tomato and Caper Dressing | This Girl’s Gotta Eat! 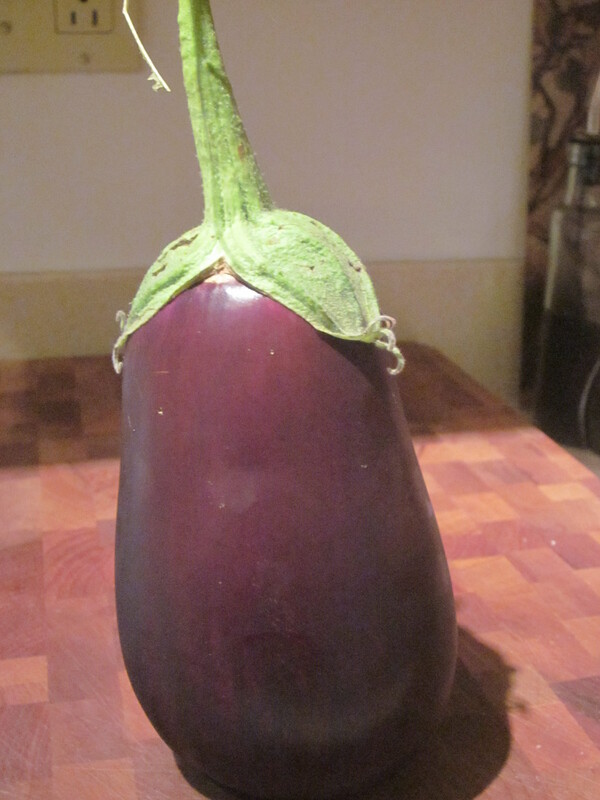 I’ve had some great successes in my first garden, like this beautiful eggplant shown here! I waited all summer for something to grow and when it finally did, it came out perfect! Pretty maybe…too pretty to eat? No way! My garden eggplant was tonight’s dinner inspiration – along with two great recipes from Food Everyday and Food Network Magazine. I knocked this eggplant out of the park by meshing the two recipes together and adding a few of This Girl’s touches. Thinly slice the eggplant into rounds and season with salt. Pour some flour into a dish. Beat the egg in another dish. And in a third dish, pour in some of the breadcrumbs. Dredge the eggplant rounds in the flour, then dip in the egg and coat with the breadcrumbs (make sure both sides of the eggplant are covered through this process). Heat some olive oil in a large skillet over medium heat. Working in batches, pan fry the eggplant until golden – about 2 minutes per side. You might have to add more oil in between batches if the pan looks dry. Drain on paper towels. Meanwhile, saute the onions, capers and garlic in a little olive oil over medium-low heat until tender. Next add the tomatoes and season with salt – saute for another minute. Off the heat drizzle with some red wine vinegar and toss in fresh chopped parsley and crumbled feta cheese. Set aside until the eggplant is done. To serve, top a spoonful of the tomato and caper dressing on each of the eggplant rounds. This makes a great appetizer – or for a lighter dinner, you can serve the eggplant alongside some garlic bread and a simple salad tossed with olive oil, red wine vinegar, salt and garlic powder.